Ali Muhammad Brown is an American Islamic extremist responsible for four 2014 murders that he claimed were to take “vengeance” against U.S. policy in the Middle East.Sara Jean Green, “Seattle man on ‘jihad’ pleads guilty to murder in New Jersey, admits to 3 other homicides in King County,” Seattle Times, March 7, 2018, https://www.seattletimes.com/seattle-news/crime/seattle-man-on-jihad-pleads-guilty-to-murder-in-new-jersey-admits-to-3-other-homicides-in-king-county/; “COPS: Self-styled jihadist admits to killing 4 people, calls it ‘vengeance’ for U.S. actions in Mideast,” Q13 Fox, August 20, 2014, http://q13fox.com/2014/08/20/police-man-admits-to-4-murders-calls-them-vengeance-for-u-s-actions-in-mideast/. Prior to the murders, Brown wrote in his journal that he intended to “follow” ISIS and “learn proper ways of jihadi training.”Ben Finley, “Prosecutor: Seattle man charged with killing 4 was on terrorism watch list,” Seattle Times, January 20, 2016, www.seattletimes.com/seattle-news/crime/hearing-set-for-seattle-man-charged-in-nj-murder-terrorism-case/. Brown is also believed to have supplied funds to the Somali-based terror group al-Shabab, and was on a federal terrorism watch list.Chris Ingalls, “Seattle murder suspect tied to former terrorism ring,” King 5 News, August 20, 2014, https://web.archive.org/web/20141216023957/http://www.king5.com/story/news/local/2014/08/20/shumpert-ali-muhammad-brown/14361609. He is serving a separate 36 ½-year prison sentence in New Jersey on armed robbery and weapons charges.Ashley Fantz, Pamela Brown and Aaron Cooper, “Police: Seattle man’s hatred of U.S. foreign policy motivated killings,” CNN, September 16, 2014, www.cnn.com/2014/09/16/justice/ali-brown-charges-killing-spree/; Nicole Hensley, “Seattle fugitive suspected of killing two gay men nabbed in New Jersey,” New York Daily News, July 19, 2014, www.nydailynews.com/news/crime/man-sought-seattle-gay-hate-crime-murders-nabbed-new-jersey-article-1.1873190. Brown was born in the United States in the mid-1980s. At the time of his first killing, he lived in Seattle, Washington, though news reports characterized Brown as “homeless” or “transient.”Ashley Fantz, Pamela Brown and Aaron Cooper, “Police: Seattle man’s hatred of U.S. foreign policy motivated killings,” CNN, September 16, 2014, www.cnn.com/2014/09/16/justice/ali-brown-charges-killing-spree/; Nicole Hensley, “Seattle fugitive suspected of killing two gay men nabbed in New Jersey,” New York Daily News, July 19, 2014, www.nydailynews.com/news/crime/man-sought-seattle-gay-hate-crime-murders-nabbed-new-jersey-article-1.1873190. Between January 2002 and November 2004, Brown and three other men allegedly committed check fraud in order to fund al-Shabab. The men deposited fake checks to numerous banks, including Bank of America and Wells Fargo, and withdrew funds before the checks bounced. Christine Clarridge, “Defendant calls four slayings justified, charging papers say,” Seattle Times, August 21, 2014, www.seattletimes.com/seattle-news/defendant-calls-four-slayings-justified-charging-papers-say/. Brown was convicted on bank fraud charges, but federal agents were unable to prove the funds ultimately supported terrorism. Ruben Shumpert, the leader of the ring, was absent at his 2006 federal sentencing and is believed to have been killed while fighting for al-Shabab.Chris Ingalls, “Seattle murder suspect tied to former terrorism ring,” King 5 News, August 20, 2014, https://web.archive.org/web/20141216023957/http://www.king5.com/story/news/local/2014/08/20/shumpert-ali-muhammad-brown/14361609. In 2008, Brown was convicted on charges of assault.Christine Clarridge, “Defendant calls four slayings justified, charging papers say,” Seattle Times, August 21, 2014, www.seattletimes.com/seattle-news/defendant-calls-four-slayings-justified-charging-papers-say/. In 2012, he was convicted on charges of communication with a minor for immoral purposes and was sentenced to a year in prison.Bill Wichert, “Accused Brendan Tevlin killer gets lengthy prison term in armed robbery,” NJ.com, January 20, 2016, www.nj.com/essex/index.ssf/2016/01/accused_brendan_tevlin_killer_gets_lengthy_prison.html. In April 2014, Brown drove up behind a pedestrian named Leroy Henderson in Skyway, Washington, and shot him 10 times in the back. The two men did not know each other.John K. Pavlovich, “Certification for Determination of Probable Cause,” King County Sherriff’s Office, August 18, 2014, 1, documents.latimes.com/ali-muhammad-brown-says-he-killed-four-men-gain-vengeance-against-us/; “COPS: Self-styled jihadist admits to killing 4 people, calls it ‘vengeance’ for U.S. actions in Mideast,” Q13 Fox, August 20, 2014, q13fox.com/2014/08/20/police-man-admits-to-4-murders-calls-them-vengeance-for-u-s-actions-in-mideast/. On June 1, 2014, Brown, utilizing a dating app, met two gay men, Dwone Anderson-Young and Ahmed Said, at a Seattle gay club.Nicole Hensley, “Seattle fugitive suspected of killing two gay men nabbed in New Jersey,” New York Daily News, July 19, 2014, www.nydailynews.com/news/crime/man-sought-seattle-gay-hate-crime-murders-nabbed-new-jersey-article-1.1873190. The three men returned to the home of one of the victims, and, according to a police report, Brown “executed” them in the street. Later in June, in West Orange, New Jersey, Brown and two suspected co-conspirators drove up next to a car operated by Brendan Tevlin at a traffic light. Brown exited the car and shot Tevlin—whom he did not know—eight times at close range.John K. Pavlovich, “Certification for Determination of Probable Cause,” King County Sherriff’s Office, August 18, 2014, 9, documents.latimes.com/ali-muhammad-brown-says-he-killed-four-men-gain-vengeance-against-us/. Brown made use of fake IDs, camouflage, and disguises to evade the police for nearly a month following the final killing.Bill Wichert, “Accused Brendan Tevlin killer gets lengthy prison term in armed robbery,” NJ.com, January 20, 2016, www.nj.com/essex/index.ssf/2016/01/accused_brendan_tevlin_killer_gets_lengthy_prison.html. As revealed in police interviews after the murders, in spring 2014 Brown felt compelled to act against the United States as vengeance for civilians, particularly children, whom Brown claimed were being killed by the U.S. government in Iraq, Syria, Afghanistan, and Iran. As Brown later said in a police interview, “[if] a man sees evil then he must take action against that evil.” Brown further admitted in his interview that he sought out adult males unaccompanied by females, children, or the elderly. He referred to these men as “just kills.”John K. Pavlovich, “Certification for Determination of Probable Cause,” King County Sherriff’s Office, August 18, 2014, 6, documents.latimes.com/ali-muhammad-brown-says-he-killed-four-men-gain-vengeance-against-us/. Following the final murder, Brown robbed two New Jersey men in separate incidents on June 29 and July 10.David Rose, “Double murder suspect wanted in Seattle, Ali Muhammad Brown, arrested in New Jersey,” Q13 Fox, July 18, 2014, q13fox.com/2014/07/18/ali-muhammed-brown-seattle-police-searching-for-double-murder-suspect/; Bill Wichert, “Accused Brendan Tevlin killer gets lengthy prison term in armed robbery,” NJ.com, January 20, 2016, www.nj.com/essex/index.ssf/2016/01/accused_brendan_tevlin_killer_gets_lengthy_prison.html. On July 18, police discovered Brown hiding in the woods in a makeshift shelter in West Orange, New Jersey, only a couple hundred yards from the site of the July 10 robbery.Eric Kiefer, “Accused ‘Terrorist’ Convicted Of Armed Robbery In N.J.,” Montclair Patch, November 18, 2015, patch.com/new-jersey/montclair/accused-terrorist-convicted-armed-robbery-nj-0. 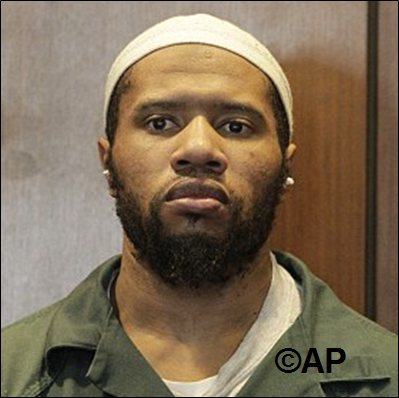 Liam Stack, “Man Accused in Killing Is Indicted on Terrorism Charges, a First for New Jersey,” New York Times, July 2, 2015, www.nytimes.com/2015/07/03/nyregion/man-accused-in-killing-is-indicted-on-terrorism-charges-a-first-for-new-jersey.html?_r=0. In July 2015, Brown was indicted on terrorism charges in New Jersey—making it the first time New Jersey prosecutors used terrorism charges against a defendant in a murder case. Liam Stack, “Man Accused in Killing Is Indicted on Terrorism Charges, a First for New Jersey,” New York Times, July 2, 2015, http://www.nytimes.com/2015/07/03/nyregion/man-accused-in-killing-is-indicted-on-terrorism-charges-a-first-for-new-jersey.html?_r=0. In August 2015, Brown pled “not guilty” to all charges in New Jersey.Bill Witchert, “Brendan Tevlin executed for being an American, mother says,” NJ.com, August 4, 2015, www.nj.com/essex/index.ssf/2015/08/brendan_tevlin_executed_for_being_an_american_moth.html#incart_river. In January 2016, a New Jersey court sentenced Brown to 36 ½ years in prison for robbery and weapons charges. Brown currently awaits sentencing for Tevlin’s murder, which he pled guilty to on March 6, 2018, along with pleading guilty to the murder of the three men in Seattle.Thomas Moriarty, “Terror-inspired killer admits gunning down Brendan Tevlin, 3 others,” Seattle Times, March 6, 2018, http://www.nj.com/essex/index.ssf/2018/03/ali_muhammad_brown_pleads_guilty_in_brendan_tevlin.html. Ali Muhammad Brown is an American Islamic extremist responsible for four 2014 murders that he claimed were to take “vengeance” against U.S.
“My mission is vengeance. For the lives, millions of lives are lost every day… Syria, Afghanistan, all these places where innocent lives are being taken every single day … All these lives are taken every single day by America, by this government. So a life for a life.”“COPS: Self-styled jihadist admits to killing 4 people, calls it ‘vengeance’ for U.S. actions in Mideast,” Q13 Fox, August 20, 2014, http://q13fox.com/2014/08/20/police-man-admits-to-4-murders-calls-them-vengeance-for-u-s-actions-in-mideast/.